The Clinical Trial. Blood cancer can’t wait. There was a bit of a buzz when the June 1 issue of haemotologica hit the MPN newsstands. 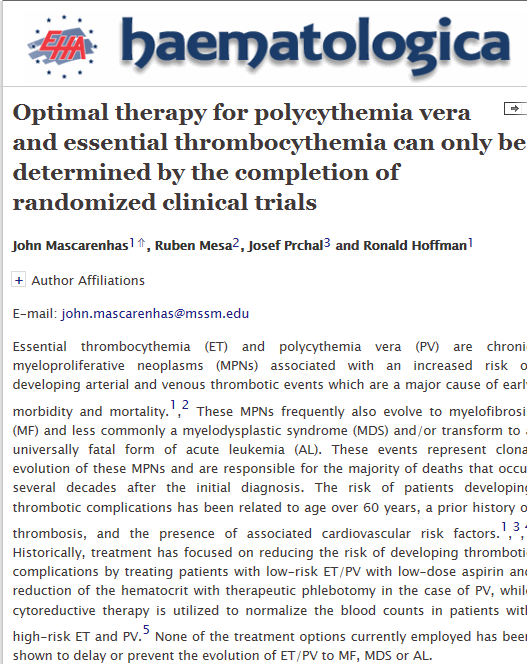 Optimal therapy for polycythemia vera and essential thrombocythemia can only be determined by the completion of randomized clinical trials is both challenging and controversial in its downgrading of the most common MPN medicine: off label drugs. These are drugs approved by the FDA but not for specific MPNs. Although widely read as an attack on interferon, the MPN workhorse drug hydroxyurea is also an off label drug. Randomized clinical trials may indeed be the gold standard but they are both long and costly, subject to error and misinterpretation. The principal authors of this carefully researched paper, Drs. Ron Hoffman and John Mascarenhas, are familiar with the difficulties. Their Phase III trial of HU versus Pegasys for high risk ET and PV patients is designed to test the efficacy of these two drugs in a clinical trial setting. Although this Mount Sinai study was started in 2011, it has yet to accrue its full complement of patients and is still recruiting. Results from that study and possible FDA approval of Pegasys is still distant. Had we waited and not taken off-label drugs prescribed by our physicians, many of us would not be here today to discuss the virtues of the randomized clinical trial..
Clinical trials are a multi-billion dollar industry. The medical and academic establishments depend on the funds Big Pharma pours into these trials. One result is small, innovative science — the kind practiced by Gregor Mendel and Alick Isaacs and Shaoguang Li– is throttled. Remember Shaoguang Li and his ALOX5 JAK pathway blocker, and over the counter zileuton? He continues to work in his small lab and has produced results ready for trial. No sponsor is available. Many clinical trials have little to do with science. The Incyte RESPONSE Phase 3 clinical trial (LINK) isn’t about science and certainly not about a cure. It’s a demonstration of finance and marketing, millions poured into a clinical trial to get FDA approval to sell Jakafi, a drug fast-tracked to help MF patients, into expanded markets. With government research financing on the ropes, scientific researchers face the daunting gauntlet of a five year multimillion dollar clinical trial process…if they’re lucky enough to find a deep pockets sponsor. The system is broken. There is evidence-based medicine beyond the clinical trial, proof gleaned from years of successful treatment of thousands of patients. Surely there’s room for both to exist in the MPN world where effective drugs are in short supply or non-existent. For more information on off-label drugs see the paper prepared by Dr. John Crispino for the MPN Research Foundation.